Is your home or business invisible half of the time? 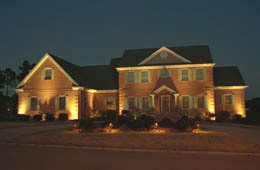 Proper outdoor lighting is paramount in making any home or business safe, comfortable, and attractive. After sundown, darkness can provide cover for undesireables and can be a shadowy void where unseen objects create a safety hazard. 1. Always listening to the needs and concerns of our customers. participant in the design of their system. products we sell and install. 4. Never questioning the customer; It's Their System! At LightSculptors, we pride ourselves on being experts in system design, installation and maintenance.